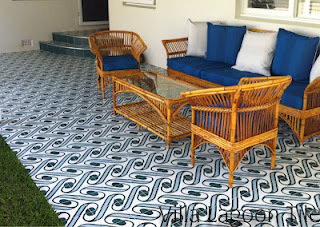 We can provide our "federal style" encaustic tile for Australian jobs. Contact us for tile when restoring a heritage property or to give old world style to your new property or renovation. Phone 1-251-968-3375 or info@VillaLagoonTile.com. This Australian client used our exclusive Surf Aqua on an outdoor patio. We made the tile and he used our recommended logistics company to bring his tile directly to his door. Contact us for questions about shipping our tile to your home or business in Australia or New Zealand. It is not really practical to send small orders but if you need over 35 square meters of cement tile, it can be sent to you on a freight pallet in a container. Air freight is usually not practical as cement tile is quite heavy. We now have a much closer tile studio for Australia and New Zealand. Our South Beach Collection is produced in Southeast Asia. Cement tile, also known as hydraulic tile or encaustic tile is usually found in antique floor mosaics, tesselated tile or mosaic tile patterns, and is regionally known by other names, including mosaico, mosaicos hidraulicos, Redondo tile, Mission tile, Barcelona tile, Cuban tile, Moroccan tile, Carreaux de ciment, Potosi, Incrusted Tile, Victorian Tiles, Mattonelle Cementine, piastrelle decorate, Baldosas Hidraulicas, Ladrilhos Hidraulicos, Impasta, Encausti or Mattonelle Vittoriane, Carrelage, Portuguese tegels, Baldosas de mosaicos hidraulicos also known as Manilans as Malaga in the Philippines, and called simply cement tile (carrelages du ciment) in France and Belgium. Hundreds of patterns and bespoke tile options.